If you're missing teeth, you're quality of life is severely compromised. 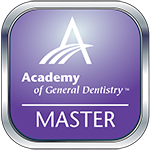 At San Marcos Gentle Dental, we offer the latest technology to replace missing teeth. With dental implants, Dr. Donnelly can replace one missing tooth, or permanently secure a full denture. Check out our Dental Implants Videos! Dental Implants are the number one restorative option for the treatment of missing teeth. They are safe and appropriate for most patients who wish to replace missing teeth and are in good overall health. Today's dental implants are virtually indistinguishable from your natural teeth. The implants themselves are small titanium posts which are surgically placed where teeth are missing. These metal anchors act as your tooth roots, only stronger, and a crown is then attached to the implant to simulate a real tooth. Every year thousands of people experience the hidden rewards of dental implants. Our goal for each and every dental implant we perform is the maximum strength and longevity of the reconstruction procedure. Dental implants are stronger and more durable than bridges and dentures and can be expected to last a lifetime. Unlike bridges and dentures alone, which can cause damage to adjacent teeth and may even contribute to bone loss, dental implants integrate directly into your bone structure. This makes dental implants stronger, more natural looking and longer lasting. Traditional dentures slip out and become uncomfortable over time. Implant dentures will allow you to once again speak and eat with comfort and confidence. They offer patients security and freedom from the messy adhesives associated with dentures. Your implant dentures will look, feel, and function just like actual teeth. With implant dentures, you will once again be able to comfortably eat all of your favorite foods. For more information about dental implants visit www.nobelsmile.com. 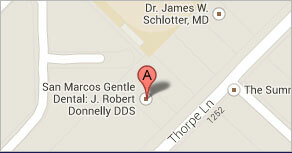 Call San Marcos Gentle Dental to schedule your dental implant or implant dentures appointment. 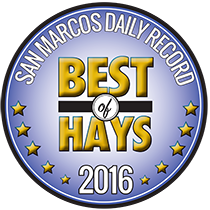 Dr. J. Robert Donnelly provides world-class dental care for residents of San Marcos, New Braunfels, Kyle, Wimberley, and beyond.